Trainer Chris Waller’s second string Cox Plate contender D’Argento is ready to step up and prove his credentials against his super star stablemate Winx at The Valley on Saturday. D’Argento, above, is set to take on his stablemate Winx in the 2018 Cox Plate at The Valley. Photo by Steve Hart. Winx is a dominant $1.22 favourite at Ladbrokes.com.au to win her fourth straight Group 1 $5m Ladbrokes Cox Plate (2040m) while D’Argento is one of the outsiders of the eight horse field at $41. The stablemates have only meet once when D’Argento finished three lengths behind Winx in the Group 1 $500,000 Winx Stakes (1400m) at Randwick on August 18 and Waller is confident that the four year old grey is ready to perform at his best when he comes up against the world’s number rated race horse in Winx. “He certainly gets his chance to prove himself on Saturday and he went to Moonee Valley on Tuesday morning where he got around the track very well,” Waller said. 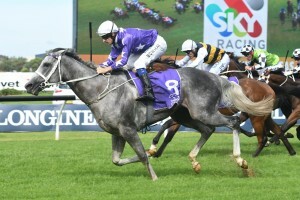 D’Argento was one of the star three year olds during the 2018 Sydney Autumn Carnival with a win in the Group 1 $600,000 Sky Racing Rosehill Guineas (2000m) at Rosehill but has failed to find the winner’s stall since. At his second Spring Carnival outing the So You Think four year old claimed second spot behind Home Of The Brave in the Group 2 $200,000 Theo Marks Stakes (1300m) at Rosehill before running finding the runner’s up stall again behind Hartnell in the Group 1 $1m Epsom Handicap (1600m) at Randwick prior to his unlucky last start fifth in the Group 1 $1m Ladbrokes Stakes (2000m) at Caulfield a fortnight ago. Kerrin McEvoy takes the ride on D’Argento who has drawn barrier two while Winx will jump from gate six with regular rider Hugh Bowman in the saddle again.